The Russian ruble has been collapsing, gradually at first but very rapidly of late. Many commentators in the mainstream blame the shrinking price of oil, upon which much of the Russian economy depends. The Economic Collapse blog reports that the more immediate symptoms are a result of a Russian government bailout of Rosneft, a Russian oil company that cannot refinance its loans with western banks due to economic sanctions. This involved the printing of a great sum of money... which, contrary to Paul Krugman and the Keynesian faithful, always harms the people because it reduces their buying power. 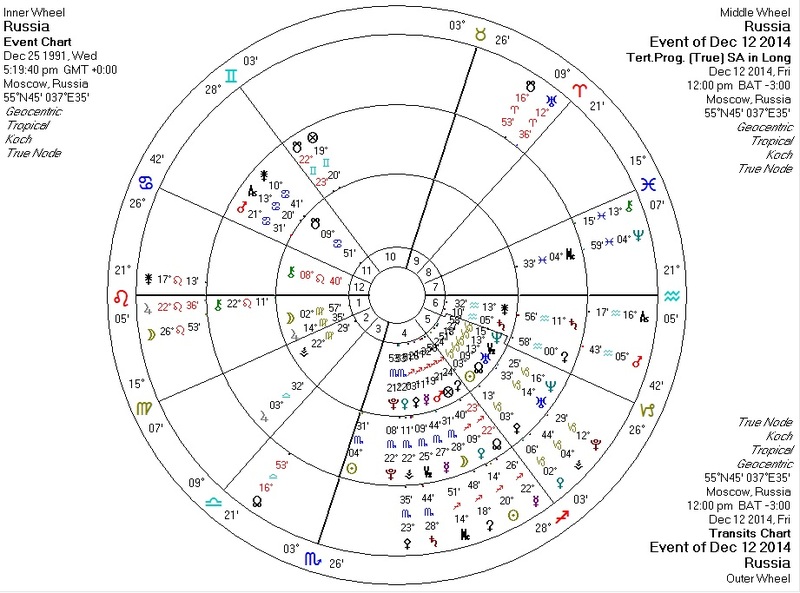 Transits and tertiary progressions for the day the bailout against the chart for Russia tell an interesting story. Usually I go for normal secondary progressions, but in this case the tertiary progressions seem to be more interesting. Transiting Jupiter at the Ascendant conjunct tertiary progressed Chiron square Russia Venus: an expansive open wound to the money supply. Transiting Nodes square Russia Neptune, ruler of Eighth House: a turning point involving dissolution and debt/banking. Tertiary progressed Mars trine Russia Pluto/Venus: the activation of destructive financial measures. Transiting Pallas conjunct Russia Venus: an ethical consideration regarding money. Transiting Venus conjunct tertiary progressed Pallas and Russia Sun: a strategic/ethical financial event which affects the nation. Libertarians generally oppose bailouts because they reward failures and punish success. They also oppose sanctions and economic controls because they eventually harm all parties involved. I don't know what to make of a bailout used to defend against sanctions, but it seems clear that much pain will be involved all around. Russia's Vladimir Putin is possibly the most capable major head of state in the world today, but he has not shown himself to be immune to the seductive lure of bailouts, embargoes, and economic controls. It will be interesting to see how he decides to steer Russia through the ongoing storm of attacks from the USA and her puppets.